If you're living with lactose intolerance, it's wise to check food labels often to avoid uncomfortable and embarrassing symptoms. While peanut butter is often a safe choice, some versions may contain lactose, triggering digestive woes. Depending on your sensitivity level, your reaction to these nutty spreads may range from mild to severe; however, choosing the right products can help spare you any lactose-related discomfort. Lactose is a type of sugar found in dairy products such as milk, cream or cheese. If you can't tolerate this sugar, it's because you lack the enzyme lactase, which is needed to break down lactose. Lactose intolerance is a digestive issue that's unrelated to allergies -- and may cause symptoms such as gas, bloating, abdominal pain and nausea. Only a medical professional can determine if you are lactose-intolerant or suffer from an unrelated condition. Despite the name, peanut butter does not contain any dairy butter. Also, peanuts, being nondairy products, don't contain any lactose themselves. 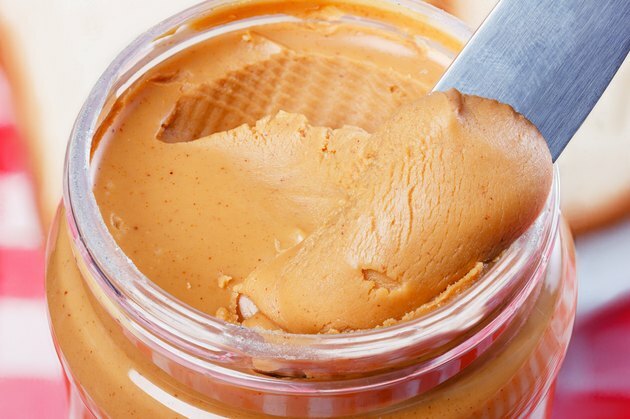 Most natural peanut butter is safe to eat if you're lactose-intolerant. To avoid any potential digestive problems, spread your peanut butter onto French bread or bagels, which are less likely to contain lactose than other commercial breads and crackers, notes the Sutter Health website. Natural peanut butter on celery sticks is another healthy, lactose-free option. Not all peanut butters are created equal; some may contain dairy products, providing some lactose. Read ingredient labels. If you see that the peanut butter contains whey, milk solids or milk powder, you know to steer clear. Peanut butter candies, such as chocolate peanut butter cups, are also likely to contain milk -- or even pure lactose -- so you may need to avoid these as well. If you experience a reaction after eating peanut butter, it's possible that allergies, not lactose, are to blame. Along with seafood and tree nuts, peanuts are among the most common allergy culprits among both adults and children, according to MedlinePlus. An allergy occurs when your immune system reacts abnormally to a substance, releasing histamines and other chemicals into your bloodstream. Allergy symptoms may include hives, oral swelling or itching, diarrhea, upset stomach and trouble breathing. Allergies can be life-threatening in severe cases, requiring prompt medical intervention. What Are Foods to Avoid With a Dairy Allergy?